Whether it’s in or out of headlines, the Ukraine crisis continues. According to the UN, almost ten thousand have died since the conflict started in April 2014, and tens of thousands more have been left wounded. In mid-summer 2014, Vitaliy Dubil - an Executive MBA graduate from Spain’s IE Business School - set out on a mission to help his fellow countrymen. He co-founded Support Hospitals in Ukraine, a humanitarian project supporting medical efforts in the region. Over the past two years, his team has shipped around $1.6 million-worth of medical equipment and supplies from the US to hospitals in Ukraine. Three 40-foot containers have already been delivered. But Vitaliy’s taking a long-term view. “There’s a huge humanitarian crisis in Ukraine,” he says. “Most of our hospitals are underfunded by the state, and have been since the restoration of Ukraine’s independence 25 years ago. When Vitaliy – alongside fellow US-based Ukrainian Pasha Fedorenko and a medical volunteer from Texas, Jeannie Slater Martin – started out, finding funding and suppliers, organizing logistics, and negotiating partnerships with regional administrations in Ukraine, took several months. “Our main challenge was that we didn’t have any experience in sending large cargoes overseas. We just had ideas and passion to help our countrymen,” Vitaliy explains. The first container of medical equipment was delivered to two large hospitals in Dnipro in December 2014. Later, the project also supported hospitals in Kiev, Zaporizhzhya, and smaller towns in the war zone. Vitaly’s team are now partnered with Project C.U.R.E., the largest provider of donated medical supplies in the world, with an aim to raise $100,000 and ship two more containers. For every dollar donated, Support Hospitals in Ukraine can ship $22-to-25-worth of equipment and supplies. A fourth shipment is expected this Spring. Vitaliy was born in Dnipro, the largest city in Eastern Ukraine not directly affected by the war, and where the majority of his medical supplies are sent. Partnerships with NGOs and local government bodies ensure the humanitarian aid gets to its intended destination. Since launching the project, he’s received two awards from different Dnipro-based government bodies for his outstanding service to the local community. 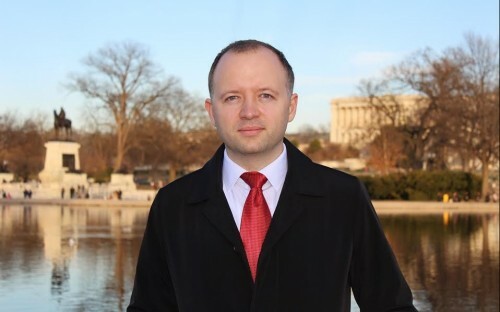 Vitaliy works on his voluntary project in his spare time - on weekends, evenings and lunchbreaks – alongside a full-time job at the World Bank’s International Finance Corporation (IFC) in Washington DC, where he’s been based for the past six years. In 2015, he started an Executive MBA Spain’s top-ranked business school. His experience at IE gave his humanitarian project a much-needed boost. “IE’s entrepreneurial spirit motivated me to explore new ideas on how to optimize our work and deal with obstacles,” he says. “While many similar initiatives do not proceed beyond the initial idea stage [we succeeded],” he continues.